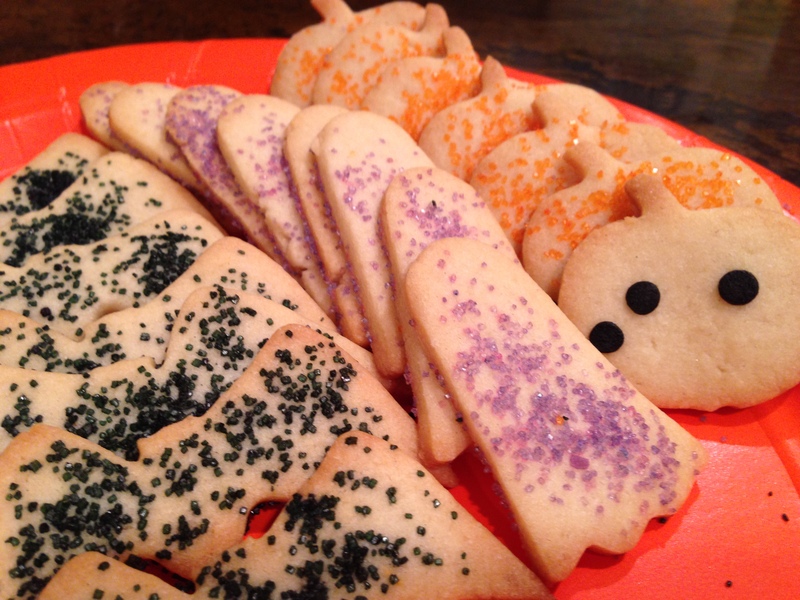 Last fall, one of the many children I have the pleasure of cooking for requested cookies to decorate for Halloween. 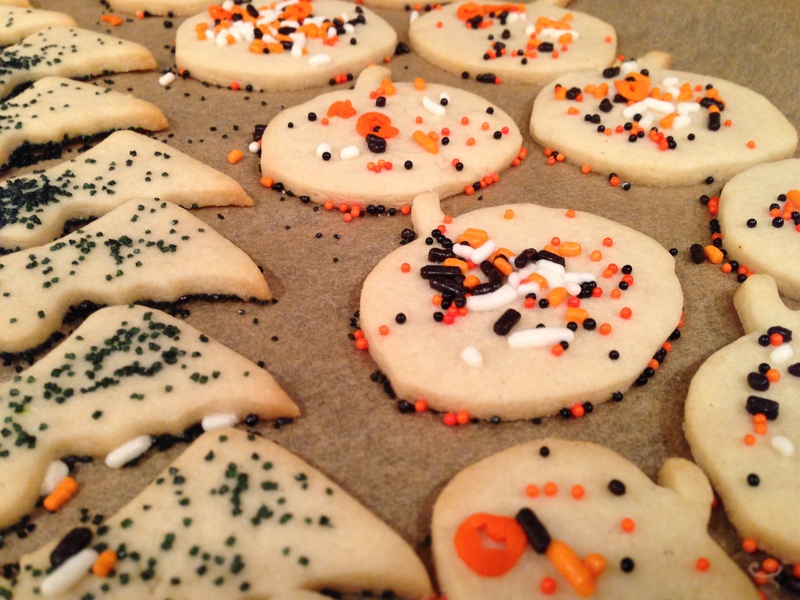 Now that Halloween is nearly here again, this seems like a good time to share my favorite cookie recipe. This one is from my “go to” baking cookbooks, Baking Illustrated. In the bowl of a standing mixer fitted with a flat beater, mix flour, sugar, and salt on low speed until combined, about 5 seconds. With mixer on low, add butter one piece at a time; continue to mix until mixture looks crumbly and slightly wet, about 1 minute longer. Add vanilla and cream cheese and mix on low until dough just begins to form large clumps, about 30 seconds. Adjust oven rack to middle position; heat oven to 375 degrees. Roll out one disk to an even 1/8-inch thickness between two large sheets of parchment paper; slide rolled dough on parchment onto baking sheet and chill until firm, about 10 minutes. Meanwhile, repeat with second disk. Working with the first portion of rolled dough, cut into desired shapes using cookie cutters and place shapes on parchment-lined baking sheet, spacing them about 1½ inches apart. At this point, I decorated my unbaked cookies with black, orange, white, and purple sprinkles (see photos), then put them in the oven. Bake until light golden brown, about 10 minutes, rotating sheet halfway through baking time. Repeat with second portion of rolled dough. (Dough scraps can be patted together, chilled, and re-rolled once.) Cool cookies on wire rack to room temperature. Another option is to glaze the cookies after they have cooled. You might add food coloring to the glaze (below), then top with sprinkles before the glaze sets. Whisk cream cheese and 2 tablespoons milk in medium bowl until combined and no lumps remain. Whisk in confectioners’ sugar until smooth, adding remaining milk as needed until glaze is thin enough to spread easily. Drizzle or spread scant teaspoon glaze with back of spoon onto each cooled cookie, as desired. This entry was posted in Desserts, Recipes and tagged Baking, Dessert, Sweets. Bookmark the permalink.